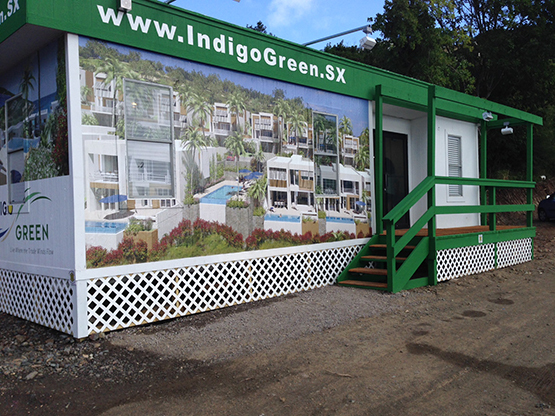 The Indigo Green sales office in St. Martin. My recent vacation to St. Martin wasn’t all pleasure. I took some time to visit a local sales office as a reconnaissance mission. Upon entering the sales office, I was first surprised by the size and, let’s say, lack of quality. As a real estate marketer, I will say that I wasn’t impressed. Inside the sales office, one lone desk sat stagnant in the tiny room. The walls were practically bare and the lighting was dim. The place lacked emotion without any visual stimulation. There is a point to all this! I was appalled by how horrible the sales experience was for $600,000 homes and visiting this sales office made me think of how well we present and package pre-construction housing here in Toronto. The market here at home is vastly different; new developments and communities sell fast and before the shovel breaks the soil. As a marketer, this style of buying forces you to deliver your best marketing time and time again. I’m proud to say I’ve contributed to making Toronto the number one pre-construction market in the world. As a result of the technology and strategy we’ve implemented in our campaigns, we sell more homes before they’re built than anywhere else. That stat alone speaks to the caliber of marketing in the Toronto scene. The way in which Toronto has grown to such a successful pre-construction market is because we offer something extra. We offer touchscreens, scale models, social media and much more, and these interactive marketing materials and showrooms create an experience for homebuyers. We attempt to sell the lifestyle and benefit of new home communities and to educate and excite them. This was solely lacking in my experience in St. Martin. We’ve evolved this way because people like me are always hungry and always searching, traveling and researching our competitors and other markets with the goal to always get better and outdo one another.